Ape and friend. 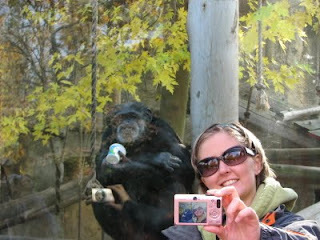 Judy is taking a picture of herself with the ape in the background. You can see it in her viewfinder. The ape is unimpressed. Perhaps he knows he'll get no royalties? Love the meta-ness of this photo. Taking a picture of the image of Judy taking a picture of Judy and the ape.